WHEN A WOMAN HAS THE SUPPORT OF HER SISTERS, SHE IS UNSTOPPABLE! Sisters Eternal WMC is an experienced women’s motorcycle club, the members of which strive to maintain a higher level of club commitment and standard of honor and to garner a deeper respect from the motorcycle community. As a result of their passion for riding as well as our dedication to the support of our community, they are respected by motorcycle and riding clubs across the nation. Sisters Eternal WMC are active members in the Confederation of Clubs and Independents, as well as the U.S.Defenders. They attend various motorcycle rights and information exchange events such as the National Coalition of Motorcyclists (NCOM), Legislative Day, state rallies, and we support ABATE efforts. They answer Calls to Action, as well as promote safety and awareness of motorcycles and their riders, which is of utmost importance. Sisters Eternal WMC is partnering with Distinctive Dolls of Houston in fundraising efforts to benefit the Alzheimer’s Association. Distinctive Dolls of Houston is a remarkably dedicated group of professional women whose mission is to promote social skills of women in order to meet the demand of contemporary society. In addition, they strive to provide positive, productive, and pleasurable activities for the community. Distinctive Dolls of Houston favors high ethical standards, values honesty and integrity, as well as embodies a strong womanly character who challenges one another to be the best they can be. Both Sisters Eternal WMC and Distinctive Dolls of Houston enjoy giving back to the community as well as raising awareness for the Alzheimer’s Association. They support the Alzheimer’s Association’s efforts in advanced research to end Alzheimer’s and dementia while enhancing care for those living with the disease. Sisters Eternal WMC and Distinctive Dolls of Houston are joining others around the world while doing what they love to honor people living with Alzheimer's, their caregivers, and those lost to the disease, while raising funds and awareness to advance the care, support and research efforts of the Alzheimer’s Association. Sisters Eternal WMC and Distinctive Dolls of Houston will be organizing an event to show their appreciation and support for the Alzheimer's Association's efforts in May of 2019. Sisters Eternal WMC, National President, Blaze needs our help with medical expenses. Please come out and show some support! Blaze was first diagnosed with degenerative joint disease thru x-rays showing that her spine is worse than a healthy 60 year old. While she continues to shovel out a bare bone minimum of no less than $1,200.00 per month (without testing, scans, and potential surgeries taken into account), she is now seeking further medical care due to brain injuries. To accompany swelling in the brain, she is fighting with memory loss, speech impediments, and thought pattern misplacements. She has grown very weary. Her body is in constant pain in conjunction with the throbbing and sharp pains of nerves misfiring in her brain. Doctors have not been able to pinpoint the cause, are continuing to test while adding further medications to the list, and discussing upcoming brain surgery. Every $1.00 is much appreciated! Thank you for your Support! Shine water Bridge run to Copper Shot Distillery in Bastrop, Texas. Located on the Colorado River. Copper Shot prides themselves on Handcrafted American Spirits, distilled on site. Come sample: Prickly Pear, Blood Orange, Apple Pie or Watermelon shine. Sisters Eternal WMC, Summer's Backyard, and Shovelhead Runway are teaming up to host one jammin' Sunday Funday!!!! Super stoked! Shovelhead Runway will be pumping out Blues and Southern Rock starting at 1:00 PM! Come join in for fun in the sun, jamming tunes, dancing, free pool, darts, and more!!! Sisters Eternal WMC will be celebrating their 5th Year Anniversary Party at Bermuda Beach in Galveston Texas on May 19th, 2018 from 10AM-4PM. All are welcome. DJ Moe with Element Entertainment and DJ Nando with Show Time Promotions will be onsite...Let's Jam!!! DJ Moe began his music career as a disc jockey for The Karaoke Kings. During this period he acquired the passion to continue the path that would then take him to the next level ……creating Element Entertainment. Being a much loved hobby, DJ Moe is passionate about planning and delivering a memorable, custom-tailored music entertainment events, which has an impact on his clients and guests. His charisma, energy and audience chemistry resonate at every one of his events. In fact, about 80% of Element Entertainments total business evolves from referrals, current clients or repeat clients themselves! DJ Nando: Tejano, Country, Cumbia, Merengue, Salsa, Hip Hop Old/New, Classic Rock, Oldies, 70-early 90's Tunes Galore! Tattoo Artist Victor Arteaga will also be slingin' ink! Meeting at the HEB Fuel Station located at 19988 Southwest Fwy, Sugar Land, TX 77479 for KSU at 9:00 AM. We will be taking the backroads from Sugar Land down to Freeport for the Blue Water Highway Run into Galveston, then up to Kemah for fun on the boardwalk by in the afternoon! Meeting at Buc-ee's 40900 US Hwy 290 Bypass, Waller, TX 77484. KSU 10:00 AM. Spring is a lovely time to reconnect with nature. The Bluebonnet Trail combines 80 miles of scenic roads and wildflowers all throughout Washington County, Texas. Grab your camera and join us for some fun in the sun! Let's get together for a fun ride through the hill country and celebrate St. Patrick's Day full of smiles and laughter at the Thirsty Parrot! Sisters Eternal WMC: Houston, TX: Lucky's Chili Powered Ride to the Top! 14th Annual Round Top Chili Cook Off at the Stone Cellar with live music by the Black Cat Choir and Abigail Taylor. Tickets are $10 at entry. Every 5th Friday of the Month, Sisters Eternal WMC teams up with The Pub 529 to host Bike Night at West Houston's Premier Sports Grill and Patio Bar!!! The original Adopt-a-Highway program began right here in Texas in 1985. Since then, it’s grown into a nationally and internationally recognized litter-prevention effort, saving taxpayers’ dollars and keeping our rights of way clean. Adopt-a-Highway currently has more than 3,800 participating groups across the state, and we salute those thousands of individuals who dedicate their time to actively make a difference and keep Texas beautiful. Sisters Eternal WMC - Texas patch holders are proud to be volunteers making an effort to keep this Texas-born program going strong. Sisters Eternal WMC - Texas currently supports FM 2977: starting at FM 762 to 2/10 mile south of Ricefield Road. Join us for a beautiful ride through the backroads of Texas to HELP KEEP TEXAS BEAUTIFUL!!! *!*! *!Who wants to ride to a castle*!*!*! This ride will kick off our ABC monthly meet and greet rides we are planning for the upcoming year. The castle features a moat (watch out for gators! ), a massive working 3,000 lb. drawbridge with an accompanying portcullis, a chapel, five round corner turrets, a courtyard, and a central keep with a dramatic view of the surrounding lands. A perimeter wall encompasses the castle, ensuring you are safe from oncoming marauders during your visit. Join Sisters Eternal WMC for the meet and greet ride and you won't be disappointed. Meet location: Stripes 19204 Farm to Market Rd 529, Cypress, TX 77433 at 7:00 A.M. Safety meeting at 7:15 A.M and KSU at 7:30 A.M Plan is to arrive at Newmans by 9:00 A.M to have breakfast. At 10:30 A.M we will head to the castle for our tour which will last 1 1/2 hours. That will be followed by lunch provided by them. The cost of the tour and lunch is $20.00 per person. It is a sack lunch and is required to purchace for the tour. On a bike or in a cage, EVERYONE IS WELCOME!!!! Sunday, September 3, 2017, Sisters Eternal WMC will be hosting DASH BIKE NIGHT with the Houston Dash Women's Soccer Team! Come out to see the newly renovated stadium: open air full service bar that overlooks the field, food venues, and more! Sisters Eternal WMC has been presented the honorable opportunity of carrying the American Flag out onto the field before the game!!! 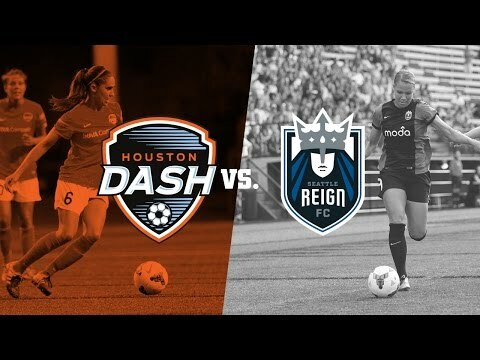 We would love it if you could all join us while we cheer on the Houston Dash ladies conquring Seattle Regin FC! Fun times and many memories to be made! For any further questions or concerns, please feel free to reach out to info@sisterseternalwmc.com! LOOK FORWARD TO SEEING YOU THERE! Sisters Eternal WMC is an experienced women’s motorcycle club, the members of which strive to maintain a higher level of club commitment and standard of honor and to garner a deeper respect from the motorcycle community. As a result of their passion for riding as well as our dedication to the support of our community, they are respected by motorcycle and riding clubs not only in the Houston, Texas area, but across the nation. Sisters Eternal WMC are active members in the Region 3 Texas Confederation of Clubs and Independents, as well as the U.S.Defenders. They attend various motorcycle rights and information exchange events such as the National Coalition of Motorcyclists (NCOM), Legislative Day, state rallies, and we support Texas ABATE efforts. They answer Calls to Action, as well as promote safety and awareness of motorcycles and their riders, which is of utmost importance. Sisters Eternal WMC and Distinctive Dolls of Houston are joining others around the world while doing what they love to honor people living with Alzheimer's, their caregivers, and those lost to the disease, while raising funds and awareness to advance the care, support and research efforts of the Alzheimer’s Association. Sisters Eternal WMC and Distinctive Dolls of Houston are organizing a motorcycle ride through the beautiful back roads of Texas on June 17, 2017 promoting The Longest Day. 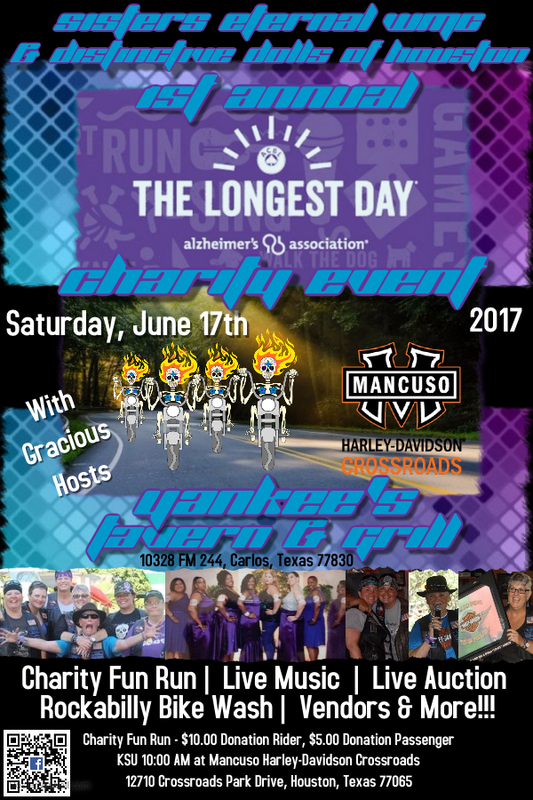 This ride will be followed by a charity event with gracious host Yankee’s Tavern and Grill located at 10328 FM 244, Carlos, TX 77830. - or contact info@sisterseternalwmc.com if you are interested in donating product to auction benefiting this great cause. All donations are tax deductible to the fullest extent allowed by law.